CAYMAN LUXURY CHARTERS MAKES YOUR WEDDING DAY SPECIAL! Trash The Dress – ladies you know you want to jump in the crystal blue water with that wedding dress on! And gentlemen – when was the last time you let loose on a waverunner IN YOUR SUIT! Photo Shoot – Sure you’ve got those awesome wedding photos – but come on board the Cayman Elusion and take some incredible photos of the two of you! Totally romantic! We can provide a photographer or bring your own! 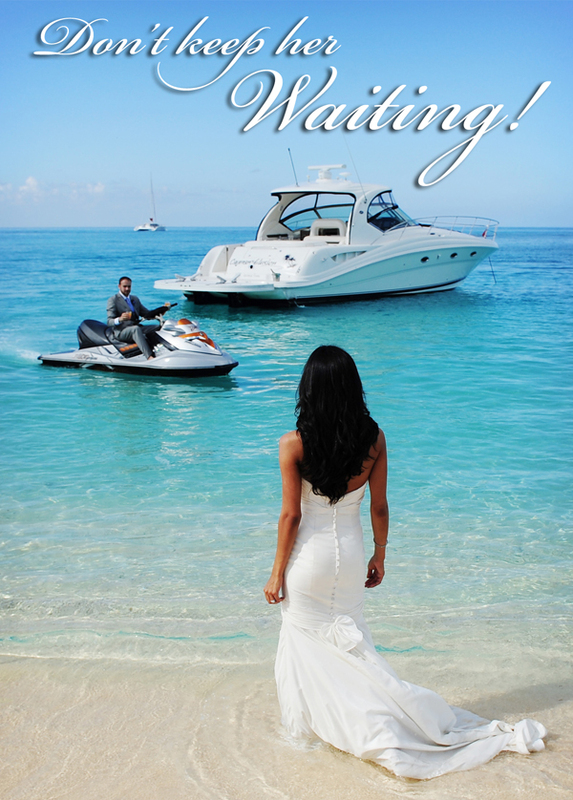 Get married on the Cayman Elusion – the ultimate wedding on board your own yacht. We take care of all the details and keep it simple. Check out our wedding package below. **Provided by an outside vendor whose charges are included in the package price. Direct deposits and/or payments required by the vendor are deducted from our charges. Getting married in Cayman is truly memorable. Contact one of our preferred wedding parnters listed below for your wedding details and make us a part of your wedding day on your own yacht! Call us now to make your wedding reservation at +1-345-938-2525 or fill out our Reservation Form and tell us wedding details in the comments box!